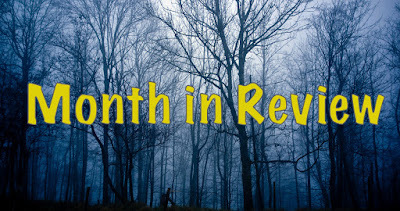 Welcome to our January Month in Review! 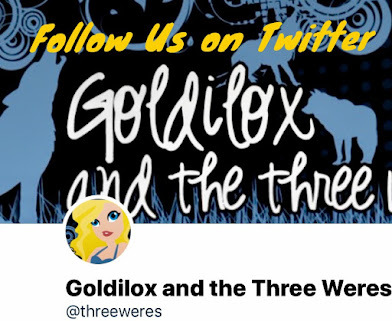 The new year is well underway so here's what we've been up to at Goldilox and the Three Weres. Gretl is looking for Dragons in this month's Show Me Yours and we want you to add your recs along with Rose Red's. We wrapped up our 2015 reading year by doing the 2015 Statistics Survey. Make sure to check out Part One and Part Two. These are some of the February releases we're most excited about. 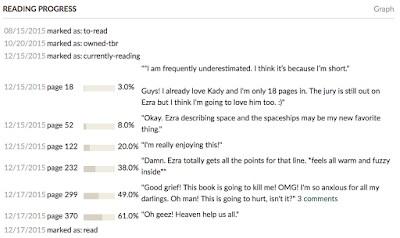 Click the titles to add them to Goodreads. 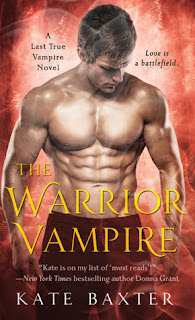 The vampire was built for sin, every inch of him tight and bulky with corded muscle. A killer, that much was apparent, and she couldn't help but wonder if his appetite for violence would rival his appetites for other...things. I'm going to be upfront and say that this book was way better than the first one. The plot wasn't as jumpy and everything just flowed better. Part of that may be because I'm more familiar with the world and the mythology, but I'm happy to report that there was no slightly confused Rose Red while reading this. I will say that this book starts slow. All the action doesn't really happen until the second half. I still love the world in this series and it just got bigger in this book. I liked seeing the introduction of different forms of magic but it seemed that this book was less focused on the main conflict between the Vampires and the Sortiari. The whole plot of this book seemed to be a side quest that meandered from what was put forward in the last book. Not that I'm complaining, it just felt weird. I do wish that we could have learned more about Naya's magic and why it's just the women in her tribe that have it and not the men. As for the characters, I liked them a lot. Ronan is a charmer and while he tends to be a tad bit possessive, it wasn't too over the top. I love that he's so loyal to his King as well. It was one of the qualities that drew me to him in the first book. Naya is a badass! Seriously! Like Ronan, I like an aggressive heroine who isn't afraid to be violent. And Naya is the "kickass and ask questions later" sort of heroine. I liked them together but the way they came together was kind of not believable. The author really relied on them being "tethered" to explain their connection/chemistry. In the end, I ship it but it wasn't all to convincing. There is one thing I really didn't like in this book and it was done intentionally. Naya's tribe is very archaic and very much a patriarchal society. The women in the tribe have no rights and basically do everything the Elders say. It drove me crazy! I guess that means it was well done but I found it weird that the Elders were more possessive of Naya than Ronan was with the whole fated to be mated trope. Overall, I enjoyed this book and read it one sitting. I liked the characters and I'm interested to see where everything is going. And that teaser for the next book has me intrigued! I want to know what's up with Jenner. If you're looking for a different paranormal read, I'd recommend picking this series up. 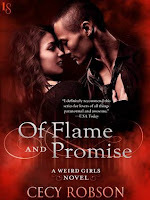 Recommended for fans of: Larissa Ione's Demonica series and Lyndsay Sands' Argeneau Vampire series. 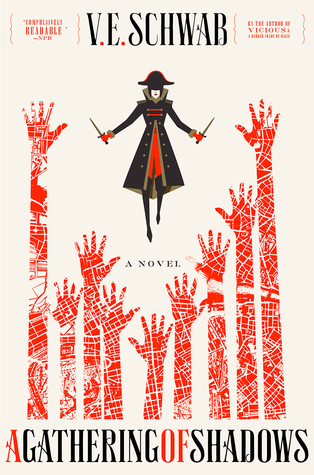 An ARC was provided by the publisher via Netgalley. 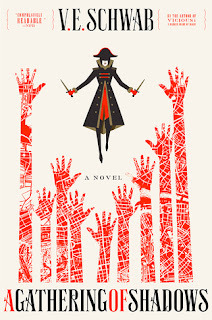 A Darker Shade of Magic was one of my top five books of 2015 so it makes sense that one of my most anticipated books of 2016 is A Gathering of Shadows! I'm so excited for this book! Kell and Lila and Rhy and a magic tournament!?! I can't even begin to guess what is going to happen in this book, but I know it will be delightful and most likely tear my heart out! WHY DO I NOT HAVE THIS BOOK IN MY HANDS?!? 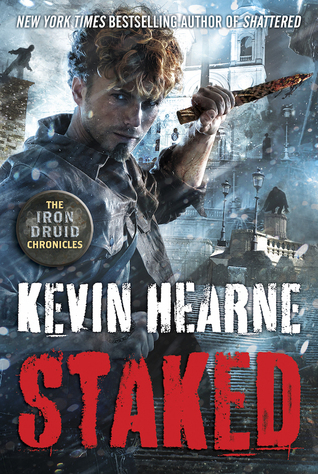 Iron Druid Atticus O’Sullivan, hero of Kevin Hearne’s epic New York Times bestselling urban fantasy series, has a point to make—and then drive into a vampire’s heart. I finally found out why you never want to be Nigel in Toronto! It’s been a running gag throughout the series and now, in the second to last book, Atticus finds himself not only in the last place you’d expect to find him, but doing the last thing you’d expect him to be doing, robbing a bank. And of course he does it in spectacular vault-door-melting, Reservoir-Dogs-referencing Iron Druid style. I loved being back in his world as he tries to defeat the ancient Theophilous and his vampire minions and end their centuries-long war on the Druids. Archdruid Owen, meanwhile, is buying a house with his girlfriend Greta and planning to train the next generation of Druids. Of course, he does it in his typical grumpy old man style, which I love. But a Druid’s life is never quiet for long, and Owen owes money to some trolls, or possibly all the trolls. His fight with a very unhappy bog troll had me laughing so hard that the dog came to see if I was I okay. But possibly the best thing ever is an entire chapter of Owen and Oberon. If you like their Twitter exchanges you won’t want to miss this. Granuaile is also off doing her own thing. She wants a little privacy from all the world’s diviners and asks the Polish witches to cloak her. In exchange for the spell, they ask her to locate a missing god and his horse. She gets a little help from Perun, who I always enjoy seeing, and meets a few new gods in the process. But Granuaile is in a dark place, obsessed with getting revenge on her stepfather for both his years of indifference as a parent and his polluting as an oil baron. I don’t remember her being as serious in her tone, or as formal in her speech as she is in the beginning of this book. I felt like she was a bit of a downer, especially when compared to Atticus and Owen. If it sounds like Staked is telling three separate stories, that’s because it kind of is. I was nearly convinced that the Druid Avengers would never assemble. Their final battle with the vampires is worth wait though. It features some great action scenes and really cool magic, like the beard vs. hair wrestling match you never knew you always wanted. I had mixed feelings about the end of the book, probably because the characters themselves are having mixed feelings after suffering some losses and disagreeing about their next move. But it starts to feel like an HEA until I remembered that there’s one more book left. There’s still an apocalypse to be averted and a vengeful god to be defeated. I realized that Loki’s plans to start Ragnarok are going to smash that HEA to bits. And I’m okay with that if it means I get to spend more time with Atticus and Oberon. If you're here reading our blog, you're probably a fan of SciFi and Fantasy just like us. You probably enjoy reading about magical creatures just as much as we do. And we can probably all agree that the most awesome magical creature, the king of the cryptids, is the DRAGON. I can name plenty of books that have a dragon in them. For example, I love the way Seanan McGuire uses them in her Incryptid series. And I loved the dragon scenes in Sorcerer to the Crown. But those are all minor characters. 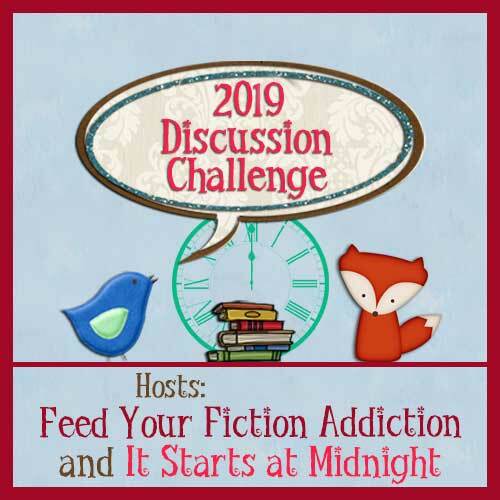 I've only read two books with a dragon as the main character, Talon by Julie Kagawa and Flight From Death by Yasmine Galenorn. I know there must be more dragon stories out there. So help me out, people! I've even got some suggestions from my co-blogger to get the ball rolling. One of my favorite dragon shifter series ever is the Dark Kings series by Donna Grant! Scotland and dragons and romance and Fae! What else do you need in a good paranormal romance? I love this series but I should point out that it is a spin-off series set in Grant's Dark World universe. You can read it by itself but it would make a lot more sense if you read it after you've read the Dark Sword and Dark Warriors series first. It says a lot about how much I love these series when I'm 22 books, 1 anthology, and 3 novellas in and I still look forward to each book released in this universe. One of my favorite dragon main characters is Julius from The Heartstrikers series by Rachel Aaron! 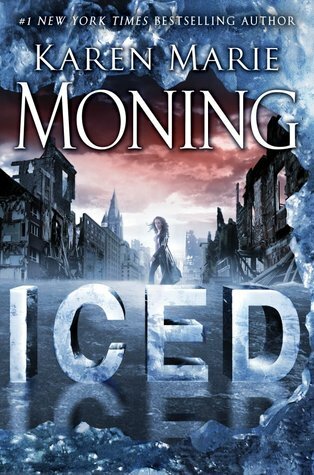 It's one of my favorite urban fantasy series! I adore Julius even though he's not your typical dragon. Actually, he's a terrible dragon. 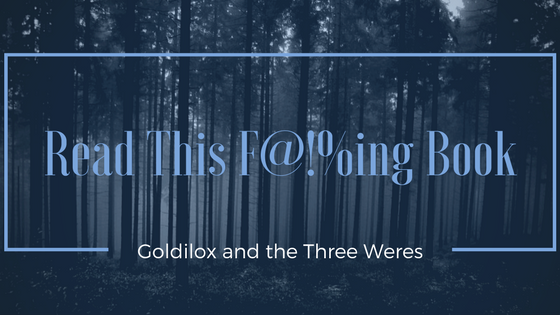 I loved this book so much that I wrote a Read This F@!%ing Book post about it. Dragons. Commercialized magic. A post-apocalyptic magical Detroit. Soul-sucking ghost cats. Pigeon-loving seers. This series has a little bit of everything! I love it so much and I can't recommend it enough! Uprooted was one of my favorite books of last year and one of the main characters is a Dragon that the local villages sacrifice one of the 17-year old daughters to for protection. It was amazing and really reminded me of the old-school fantasy books by Robin McKinley. It was like reading a new fairy tale. My review for this book can be found here. This is a book that I wish everyone would give a chance. Naomi Novik has also written another dragon series. It's an alternate history that imagines if there were dragons during the Napoleonic Wars. I've only read the first one and I enjoyed it! You can't help but love Temeraire! I love dragon books but most of the ones I've read the dragon is one of the main characters but not the main main character. And I've read several where the dragon is a villain. They're still awesome books though and I'd recommend reading them. What are your favorite Dragon books? Why do you think I should give them a chance? If you missed last month's Show Me Yours, we'd still like to hear about your favorite Gargoyles. If you have a genre or topic you'd like to see in a Show Me Yours post, let us know in the comments or send us a Facebook message. A few months ago, I discovered that I might actually like Westerns. As long as they have some magic and monsters in them. 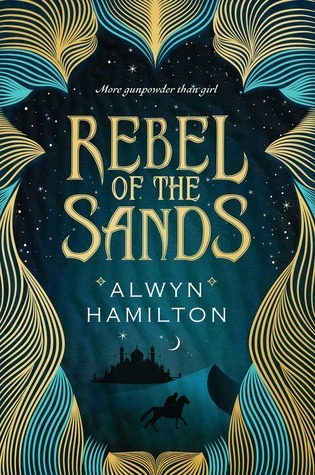 From the synopsis, Rebel of the Sands reminds me of Wake of Vultures by Lila Bowen, one of my favorite series debuts of 2015, set in the Middle East instead of the American West. I'm definitely hooked! Wickedly Ever After is set after book two in the series, Wickedly Wonderful, and features Barbara and Liam from book one. They've already had a wedding and a honeymoon, during which they appeared in Wickedly Wonderful, but those were for the human world. Now Barbara has to make it official for the supernatural world. And for that she needs the approval of the notoriously fickle Queen. Only with the Queen's approval can she share the magical potion that prolongs her life with her human husband. But rather than simply agree, the Queen sends them on a quest to complete three tasks. For each one, they stop in a different part of the country and consult a different ally. I like the fact that this novella, like the first one in the series, incorporates all three of the Baba Yagas even though it's primarily Barbara's story. I especially enjoyed seeing Beka and some of the other characters from Wickedly Wonderful again. Even more exciting was the opportunity to learn more about Liam and meet his college roommate. And I love seeing their daughter Babs with her strange mix of matter-of-fact and childish innocence again. There's just this one little thing that bugged me. I'm trying hard to overlook it since I might not have noticed if I had read book two when it first released. But it's only been a few weeks so I noticed and it's driving me crazy. Near the end of Wickedly Wonderful, Beka says "the Queen had allowed Barbara to share the Water with her new husband" to justify her own decision to share it. It had me really confused, thinking that this novella is actually set after book one. But then the Queen recounts the events of book two, and I thought there was a huge continuity problem. Actually, Wickedly Ever After does an excellent job explaining the timeline. (I looked, somewhat obsessively, for anything out of place.) It's just that one line that throws everything off. I'm trying not to hold it against the novella, which isn't the culprit. And I realize Blake can't go back and fix the already published book. 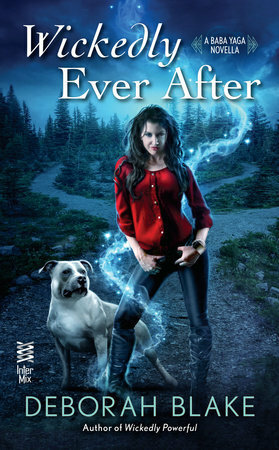 After I finished obsessing, I enjoyed Wickedly Ever After - I'm a big fan of road trip stories. It does make me wonder if each Baba is going to get a similar epilogue to her HEA. You could read this novella as an introduction the Babas' world since it does feature all the key characters, but I wouldn't recommend it. It contains spoilers for both of the previous books. You know when you read one of those books you never knew you wanted until you actually read it? 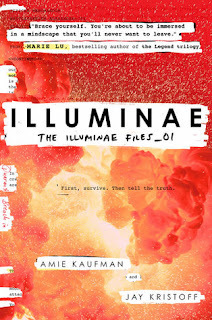 That was Illuminae for me. I went into it with high expectations because you have to be hiding under a rock in the book blogging Twitter community to not have heard the praises about this book. I wasn't even planning on reading it until some of my trusted blogging friends read it and were raving about it. It also helped that the Amazon preorder price was under $10. It blew my socks off! The book I hadn't wanted to read ended up being my favorite book of 2015. It's brilliant! And let me tell you why. Three Cheers for Epistolary Books! 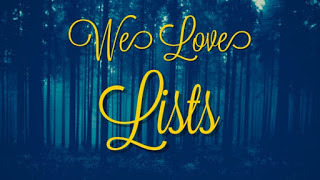 I've been a fan of epistolary novels ever since I got hooked on the Dear America books in middle school and have always loved finding more of them to read. 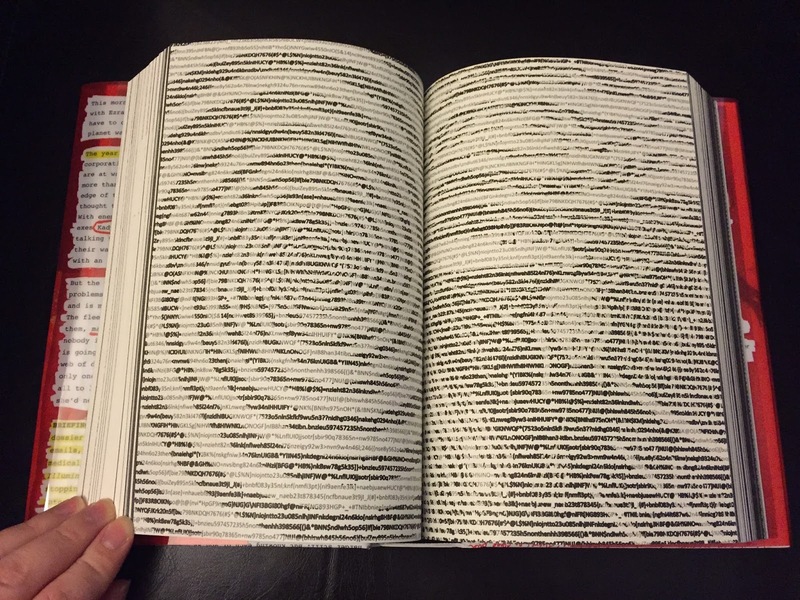 This book takes the idea of an epistolary novel and takes it to a whole new level! It is written like a dossier file of a big event. It's all hacker-retrieved secondhand accounts of said event strung together to form a picture of what happened and it does the job amazingly! The format includes emails, interviews, medial reports, IMs, and so much more! 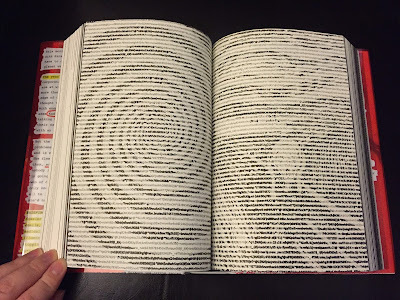 You all need to see the design of this book! The design team did a fantastic job on it! Seriously. They deserve a slow clap. I'm a total advocate of ebooks and have personally gone mostly digital in my reading but this is a book you'll want to a physical copy of. Don't believe me? Let me present Exhibit A and I'll let you decide. Let Me Use Gifs and Reaction Screenshots to Convince You To Read This Book! I really have no words to describe this book. 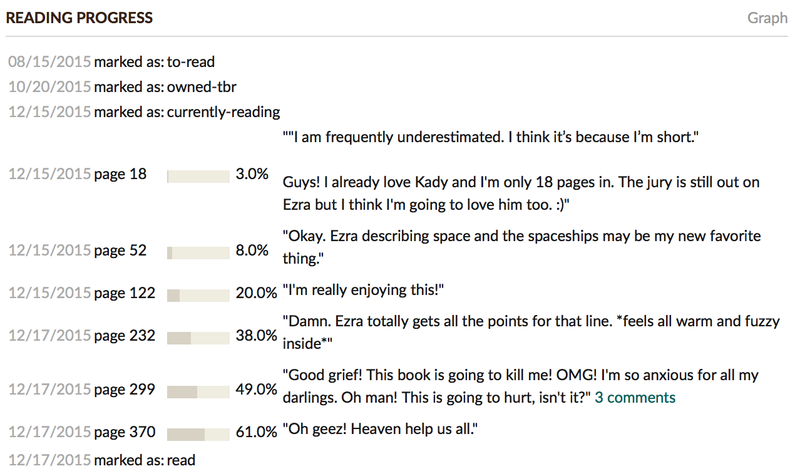 In fact, what I wrote on Goodreads and my status updates are the best I can do. It seriously took me forever to write that review and it's mostly my reaction to finishing this book. I may not be able to put a coherent review together but I do have gifs. Seriously. This was pretty much me while reading this book. Seriously. Go read this book ASAP! If you want a more wordsier review, go and check out my friend, Nikki's excellent review here.